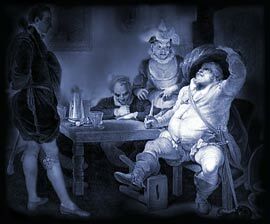 Picture - A scene featuring Falstaff the jovial, overweight Knight. This is one of Shakespeare's most popular plays, featuring the opportunistic , Sir John Falstaff. Part I is the second in a series of four English history plays that make up Shakespeare's major tetralogy. It continues the saga of the Bolingbrook family and the Plantagenet monarchy that begins with Henry IV's seizure of power in Richard II and the coming of age of Prince Henry. The plot shifts back and forth between the troubled realm of Henry IV's court and the vulgar world of the tavern in which Sir John Falstaff presides over his group of rascals and is joined by the fun-loving Prince Henry or Hal. The plot encompasses rebellion and the struggle for power. Prince Hal and Falstaff join the fighting and Hal kills the rebel Hotspur. Falstaff feigns death saying, "The better part of valour is discretion; in the which better part, I have saved my life.". The play concludes with King Henry and Hal leaving for Wales to confront rebels. At the same time, Prince John of Lancaster, Hal's younger brother, heads toward York to do battle with rebel forces led by the Earl of Northumberland (Hotspur's father). It is believed that Henry IV (Part1) was first performed between 1597 and 1598. In the Elizabethan era there was a huge demand for new entertainment and Henry IV (Part1) would have been produced immediately following the completion of the play. These quotes are amongst Shakespeare's most famous including 'The better part of valour is discretion'. Details of this famous quote follows, complete with information regarding the Act and the Scene, allowing a quick reference to the section of the play that this quotation can be found in. Please click here for the full text of the script of the play. "He will give the devil his due". Henry IV (Part1) (Act I, Scene II). Henry IV (Part1) was based on real people and events taken from English history. The characters are from the royal Houses of Lancaster and York. Click the link at the top of the page to access a list of all the cast and characters of Henry IV (Part1).